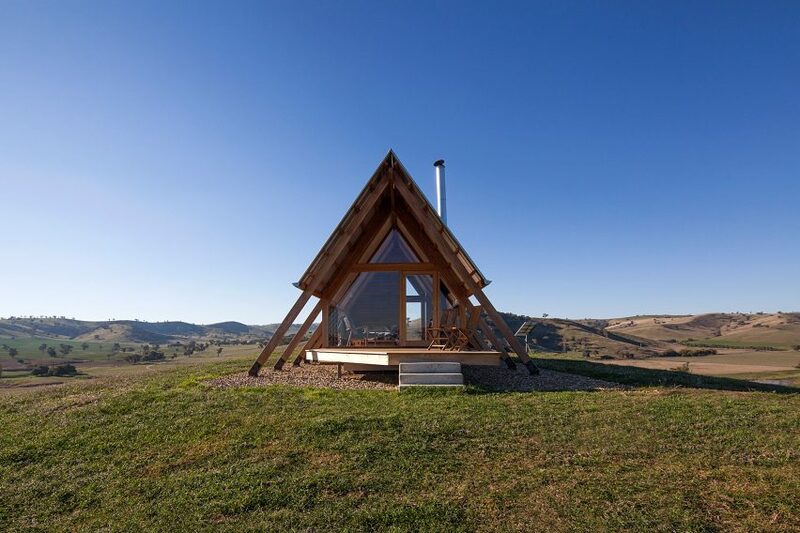 Anthony Hunt Design and Luke Stanley Architects have designed a tent-shaped rental hut for the summit of a hill in rural New South Wales, Australia. 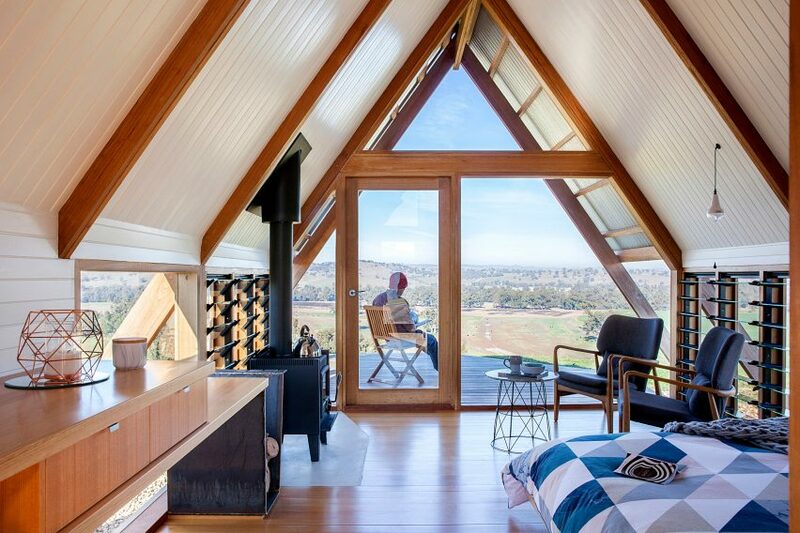 The Geelong-based studio and the Ballarat-based studio collaborated on of the A-frame structure, which was designed to be assembled in situ by a two-person team. Kimo Hut is the latest addition to the Kimo Estate, a second generation 2,800-hectare farm outside Gundagai whose owners have diversified into accommodation and events. The hut is available to rent through the short-stay lettings company Airbnb. 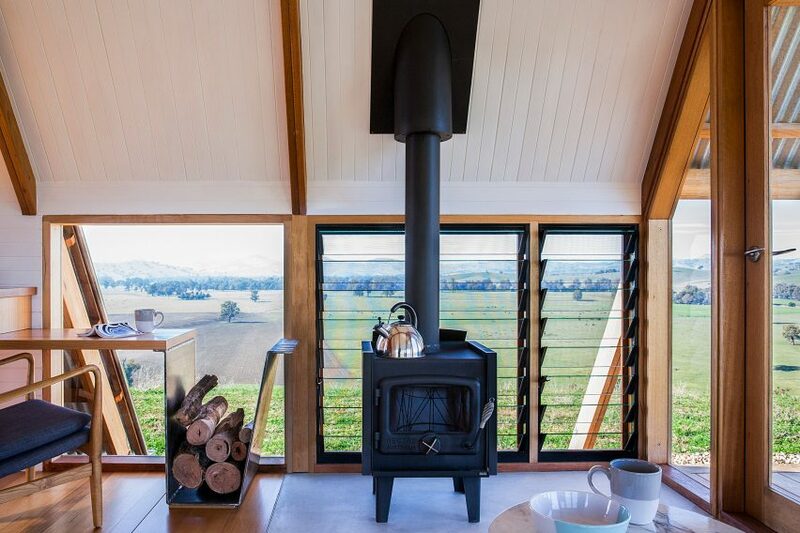 Its simple, utilitarian shape is designed to invoke a sense of refuge and connection with its natural surroundings, without standing out too much from the other agricultural buildings on the working farm. Standing at the end of a long dirt track, visitors enter the hut via a raised walkway and a glass door that permits views all the way through. The back of the hut is fully glazed, providing glorious views out over the Kimo Valley below. Cut-outs in the roof and windows at floor height also frame impressive views and allow natural light to fill the hut. Some panels have glass vents, which can be opened to create a cross breeze through the hut. The Kimo Hut is far from primitive, and has been equipped with everything from a freestanding wood-burning stove to an instant hot water system for the shower. Solar panels provide it with its own renewable power source. Part of the brief was to use environmentally friendly materials, so the architects sourced local Australian hardwood for the anchoring struts. Silvertop ash was used both inside and out, as shiplapped cladding on the exterior and for the floors. White-painted grooved pine boards line the walls. Corrugated metal forms the roof, which overhangs at the rear to create a sheltered porch outside of the bedroom. 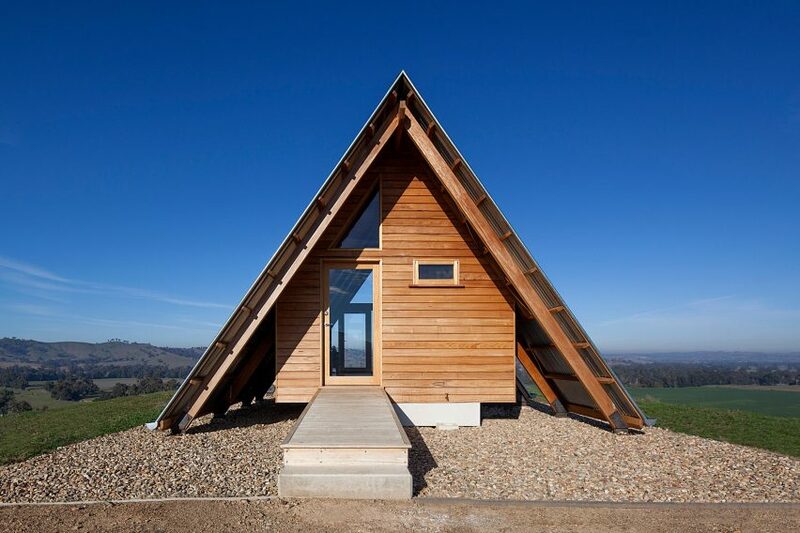 In America, architecture firm BIG recently debuted its prototype for a triangular hutthat puts a twist on traditional A-frame cabins of Upstate New York. On the island of Maui in Hawaii, architect Erin Moore built a set of cabins on a 300-year-old lava formation that has an outdoor cooking platform for guests to use while taking in the scenery.